Google Goggles is a downloadable image recognition application developed by Google. It is used for getting information by taking an image of a known or famous location or landmark, barcode, label, and etc…It may have further uses such as recognizing plants, leaves, animals, snakes, insects, and other uses. Google Goggles runs on a variety of smart phones. The Google[X] team is in the development stages of making glasses with this recognition technology. The future of using this type of technology is to make a pair of glasses that contain this technology that will stream information that will be projected to the person’s eyes in real time. The glasses will probably fit like current eyeglass viewing systems present on the market for watching movies and etc.. The plans are to design the glasses so that people who have refractive errors and need glasses to see clearly will be able to put their prescription in the glasses just like a regular pair of eyeglasses. They will be Android-based and have a 3G or 4G data connection with a variety of sensors including GPS and motion. They will have a unique navigation system that may involve head tilt. The glasses may also contain a camera to monitor the view of the person wearing them. They would be able to show them information about what the person is looking at. 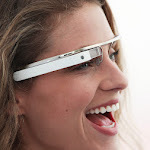 The Google Glasses or Glass Project will most likely interface with other current Google software programs as well as future projects. The Google Glasses will provide information through Google Maps, Google Latitude, and other applications. This will allow you to receive information about your location, what you are looking at, and send information or data to the cloud. Technology keeps advancing providing people with increased access to information, connectivity to each other, and ability to store information such as pictures in the cloud for future reference. Who knows, maybe with time it will help people with impaired vision see better through magnification of the world that they are looking at. This will let people with impaired vision become more mobile and self reliant.